This outpatient surgery is performed under topical anaesthetic (eyedrops only) and lasts for 10 minutes. 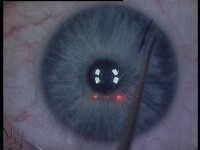 First, the corneal flap is made using the motorized keratome: its diameter is 8 to 9 mm and its thickness 160 microns. The flap is cut in such a way as to leave a hinge 0.75 mm wide which keeps it attached to the cornea. The flap is then folded back to enable the rays of the Excimer laser to remove the stroma with micrometric precision, after which the flap is replaced. 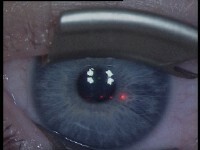 The critical period during which the laser acts on the tissue and the patient must stare at the centre of the microscope lasts less than one minute. In the newer lasers an 'eye tracker' follows the gaze and allows a perfect centration of the treated zone. In the treatment of myopia the central cornea is flattened by the action of the laser. In the treatment of hyperopia a ring of tissue is removed around the central optical zone, which increases its curvature. The endothelial pump helps the flap adhere to the corneal bed and no stitches are required. This technique ensures rapid healing with optimal patient comfort.